For morethan 50 years, SsangYong Motor research team has pursued intention, passion and craftsmanship to make automobiles, and strived for development of high quality automobiles for the best sensitive quality and customer impression based on unrivaled product capability and technical competence. 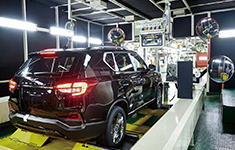 Now SsangYong Motor R&D Center is reinforcing R&D capabilities to acquire the future competitiveness by intensively investing on development of the future-oriented automotive technologies focused on expansion of eco-friendliness, safety and information function. Particularly, SsangYong Motor R&D Center is striving for providing the customers with opportunities to select more diversified models by developing competitive entry level RV models together with high quality premium automobiles with reinforced product capability of and FF monocoque platform having price competitiveness, high fuel efficiency and maximized space utilization, in addition to middle/large sized SUV and large sedan on FR platform having excellent riding comfort, power, climbing performance , driving performance, steerability, etc. On the other hand, SsangYong Motor R&D Center is reinforcing internal capabilities through expansion of R&D investment and manpower and process innovation based on the existing resources and technologies, intensifying the entire product line-up through development of eco-friendly automobile and research of advanced technologies and improving global competitiveness. Even an excellent technology is required to be harmonized with the human beings in order to be applied to the automobiles. Basic spirit of R&D Center that is a delivery room for technical competence of SsangYong Motor is always「Human Beings」. 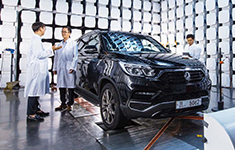 Safety technology to keep human life, emotional technology to give bigger satisfaction beyond over five senses and environmental technologies to be prepared for the future of the human beings are those technology sprits that SsangYong Motor pursues.